We've covered RetroActive's promising N64 HDMI project in the past, but the guys over at My Life in Gaming now have exclusive footage of the mod in action, and it's amazing. As anyone who has owned an N64 will know, the video output is the wrong side of average. Because the machine lacks RGB output as standard there's no easy way of solving that issue. With that in mind, the latest episode of My Life in Gaming's technically-focused video series looks at the various hardware modifications available. The unit isn't out yet, and you won't be able to buy modded consoles from RetroActive - the company will instead sell the board to modders and resellers, who will install it and then decide upon their own pricing. If you're keen to be kept in the loop then point your browser here. I would love to get that HDMI mod. I was just looking at this the other day. I'd like to know how invasive the mod is. I'm handy with a soldering iron, but I'm no wizard. If there was a way for the RGB mod to remove that awful aliasing, I'd go for that in a heart beat. @GammaPhonic RetroActive claim that it's a pretty detailed mod, with soldiering skills being a must. The site shows that the HDMI port sits below the Multi-out port, so you'll need to cut a section away from the casing as well. You know what looks even better than this? Most N64 emulators! And then you can use whatever controller you like, instead of the N64's monstrosity! This is awesome! I just dusted mine off when I found Pokemon Snap for 2 bucks at a yardsale. Have you been watching me, Nintendolife? Call me crazy, but I much prefer the n64's characteristic graphics style. It gave me very unsettling feelings to see Mario Kart 64 looking as if it was a Playstation game. Wii VC and emulators are good enough for me. But good for those who want the original hardware as the advantage is having full capabilities of N64 and no glitches other than the ones originally in the game. @linforcer There. Have your attention reply kiddo. I used a component cable with my US N64 and had no problems at all with blurry graphics on a CRT TV. Visuals were always sharp and a lot better than those pixilated PS1 games. I just use an S-video to HDMI converter with S-Video output cables and it works good, but this mod would be even better. However my method doesn't work with NES, so I'd love to see these guys do a mod for that. I'll be honest I don't get it. I mean, I see some benefits but it doesn't look like something to get hyped for. Oh how I want this. Nothing beats playing games on the original hardware. @linforcer I am actually pretty partial to the N64 controller myself. Sure I don't have the three hands I need to play it, ha ha, but it has a comfortable feel and the analog stick was the most accurate at the time (pre PS2, GCN, etc). I like emulators as they can help the visuals look vastly better, but most introduce new issues and they don't work perfectly with all games like the original hardware. I had originally sold my Nintendo 64 with it's component cable (yes Component, not Composite, it does exist) that I bought from Nintendo directly as that was the only way to buy it. I sold it with a bunch of boxed games including my collector's edition Zelda games back in around 2004. I regretted it a few years ago and have since re-bought another console with a few controllers and around 40 games. @Judgedean I remember the component cable offering a great picture for the time. I remember looking it up in the manual and paying my mom to order it from Nintendo as I was just a kid. I have no issues with the N64's graphics. I still have my old CRT TV so everything's all good. Woah, I could do with that HDMI mod. Wonder how expensive it ends up being. I can't understand why someone would buy this if you can scale the internal resolution of games to any resolution you want on an emulator and have REAL HD quality, not an upscale. And for people who say that you can't beat the sensation of holding the original controller in your hand, there are USB adapters for your N64 Controller, and you can even play with a PS3 or PS4 controller on Bluetooth. Why can't Nintendo do this for the Virtual Console? It would be nice if Nintendo would just listen as this has been a big topic for years now. I just got a framemeister and couldn't be happier. Don't have scart and looks fine. I do have a film production sony crt that I bring on feature film jobs so after we make the day, 4p smash, mario kart, 007 or perfect dark always gets played. It always looks great with real scan lines and clarity in its native 4:3 ratio. 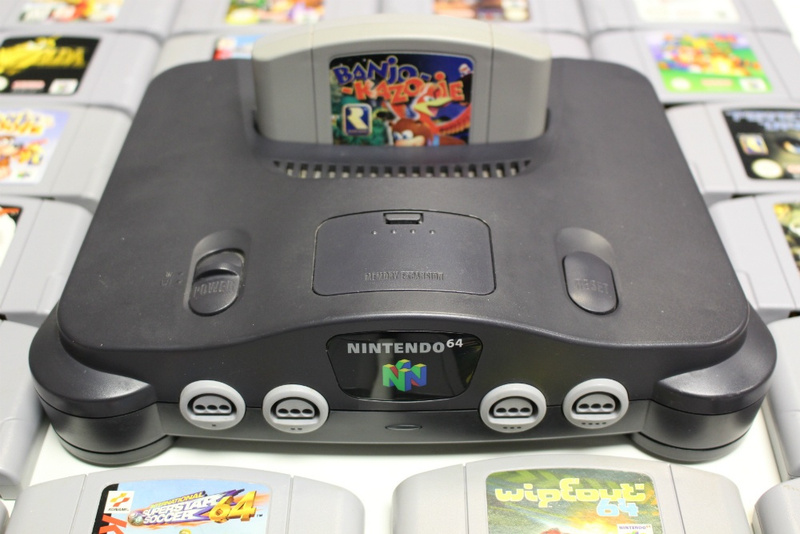 N64 was amazing the last great Nintendo system but also the start of the 3rd party decline but prob 2nd in my list of Nintendo console with the SNES all out winning. Rgb mod is easy/cheap. Xrgb not so much though. I wonder how this looks compared to rgb mod. Don't get me wrong, rgb is awesome, but I've always read n64 has an internal smoothing that creates some blur intentionally. As such, I always thought it was one of the worse looking rgb console pictures. This is beautiful! It's almost tempting to mod my N64. But honestly I have my N64 hooked up to a CRT, which is as it should be. Never liked the n64, all the games of interest(to me) are in the VC range. @SethNintendo Yeah, CRT is generally better. With modern TVs it needs to change the signal so there is some latency. It varies based on the games resolution, but sometimes it is quite bad. @TheRealThanos I guess since I don't have my N64 anymore I don't know what it would normally look like. Seems about the same to me. I was just playing my N64 a few minutes ago and I honestly can't see a difference. The quality looks about the same to me. Also, am I the only one who doesn't like scanlines? I couldn't care less. N64 games look good enough using an S-Video Cable on my Tube TV. Mind you, I don't play my retro consoles on an HDTV as it's forbidden muhaha! I just don't see the point in something like this. If you want to go old school then do it right and play these games the way they were meant to be played... on a tube TV. If you want to play old games on a modern TV, then just use an emulator, virtual console, etc. I miss my collect-a-thons, Turok, castlevania 64, and game boxes. All I can say is that I'm from the UK and every time I see one of these American videos that show off how bad all these older games looked on systems like the NES, SNES and N64, I actually feel sorry for American gamers. Games never looked this bad in my house, running on my SDTV through RGB/SCART most of the time. Seriously, just play these old N64 games on an emulator. They look about a million times better, and you can even use an alternative controller if you prefer, like the Xbox One pad. @TenEighty Because Nintendo's way these days is to REALLY half *ss stuff like this. I mean, the dullness of the colours, and especially the whites, on NES games running on the VC it just offensive imo. @Kirk I agree. Nintendo has been lazy with the Virtual Console. Even when it comes to scaling the games on a 720p or 1080p tv. They could offer pixel perfect scaling. For example, a 240p game should be scaled to 960p with a 60 pixel border on top and bottom of a 1080p tv screen. Emulators do this on the PC and they look great. Lag varies based on the tv. Crts are just too rough for me. I bought a gaming monitor and added the xrgb. It comes to 30 ms (which is less than most hdtvs) and looks incredible. The problem is most tvs don't process 240p signals correctly. My plasma which has 40 ms lag standard has well over 100 ms of lag running a snes through composite. Most tvs just dont scale correctly. 30 ms is not noticeable, 100 ms is quite noticeable. Usually people make the wrong assumption that all hdtvs are just terrible for lag when they hook up a low res signal. But games can be a joy with the right setup. The Purple Monster S-Video cable that is a Hi end quality cable screening/shielding/OFC etc is the best cable for the N64 picture quality as it actually outdoes an N64 running an RGB Mod with a normal quality scart cable. Also point of note is to say that putting said S-Video cable into my high end cinema amp which sports a HQV Reon-VX scaling chip and then outputs to 1080p through HDMI completely cleans all blurriness/jaggies from the picture which actually smooths out framerates where games were once jittery, eg parts of Banjo Tooie. This doesn't seem like a huge improvement although it does look better. Add in the added lag and I don't think you are coming out ahead. @Itglows You need to check out the RGB103 on YouTube, the HDMI mod is incredible. The retroactiv promotional videos don't do it justice.